Our good friend David (whose wife Erin I met while studying abroad in Nicaragua and she was one of my bridesmaids) came for a weekend visit from Rockford, Illinois and it was so great to see him! He flew into SFO late Friday night so we picked him up and spent some time catching up before hittin’ the hay. On Sunday we did some sightseeing…the “poor man’s Lombard Street” , Potrero Hill’s Community Garden, Golden Gate Park, Haight/Ashbury, the Castro, the Presidio, and Golden Gate Bridge (Kevin and I are becoming pros at sightseeing! 🙂 ) We had lunch at Jay’s Cheesesteak in the Mission which has great sandwiches and a ton of vegetarian meat options. 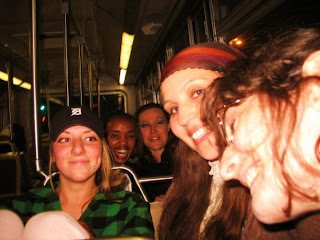 Then that evening we went to Cafe Divine in North Beach (delicious mochas!!) to see the SF Conservatory professor that David met with on Saturday perform with his jazz quartet, The Mario Guarneri Jazz Quartet. It was a fantastic show and I think David’s inspired us to become monthly regulars. This year, Thanksgiving was filled with a few “firsts” for us–first time we haven’t spent Thanksgiving in Long Beach, first time hosting the gathering, first time talking with family via video chat…but although it was filled with very new experiences, we had a really great time. Growing up, my family was extremely close with the Julian family (Diane, Dave, Matt & Brandon), so they decided to come to San Francisco and spend the holiday with us. Brandon arrived from Humboldt (where he’s earning his degree in Early Childhood Education, should be done this winter!) earlier than the rest of the gang so he stayed with us Tuesday night. 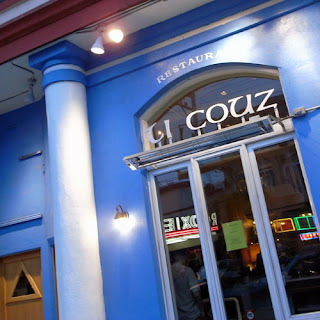 Then on Wed., Dave, Diane and Matt arrived after the long drive from LA around 11:30 so we decided to get a bite to eat. Matt had seen Cali Pho Nia which I’ve blogged about previously and was craving Vietnamese so we all enjoyed a great lunch together. That afternoon we watched a family video of us kids (the two Julian boys and the three Delmar kids) putting on skits, showing off our Halloween candy loot, and dancing the Time Warp from Rocky Horror Picture Show…awesome! The video definitely gave us some laughs, watching ourselves dancing away in our 80’s and 90’s clothes, haha. Mid-morning Kevin and I had a nice time chatting with his family via his and his brother’s PlayStation 3 gaming systems (I guess they are good for something! haha) We’ve done it a few times before but it was really special doing it on a holiday when we weren’t able to be with them in person. Brandon cuttin’ up the sweet potato fries while Jessie and Matt keep him entertained with their story-telling. Early in the afternoon my mom and Kevin surprised us with another video chat session, this time with my mom, my Aunt Tina, my Uncle Joey and Luke the family dog! 🙂 We had a great time talking with them with the video streaming, it felt like they were right in our living room with us! So what was on the menu, you ask? Well, let me show you! I had to put a special picture of Kevin’s homemade dinner rolls (and not just pour-out-the-box-and-mix-with-water kinda homemade, I’m talking yeast-and-rolling-out-the-dough-and-letting-it-rise-overnight kinda homemade! And to finish off the meal…plenty of desserts! Kevin and I were in charge of the desserts and Jessie’s friend Kimberly brought the berry pie for us to share as well. 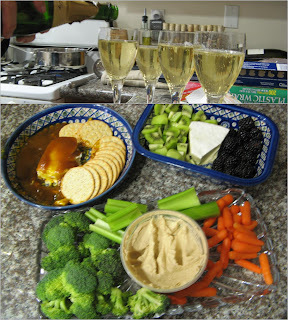 We made two pumpkin pies, capirotada (Mexican bread pudding) and a tiramisu trifle dessert…delicious! The day after Thanksgiving, instead of spending our time standing in lines with the rest of the world, we spent a quiet morning at home and then met up with the Julians at the SF Museum of Modern Art (SFMOMA) which Kevin and I hadn’t made it to yet. We went specifically to see the Richard Avedon photography exhibit but enjoyed the other exhibits as well. Now onto the main exhibit! The Student Non-Violent Coordinating Committee (SNCC) in 1963. I had researched this group for my senior thesis on black and white women’s experiences during the Civil Rights Movement (one of my favorite time periods in US History), so this was really exciting to see. After spending a couple of hours in the museum we made our way to Union Square to get a bite to eat at a small Italian cafe before heading out to see the Christmas tree lighting. After 30 minutes of holiday songs by the boy’s choir, one of the American Idol losers, and some church chorus group they finally lit the tree to everyone’s enjoyment! Then the streets flooded with people wanting to get home and I’ve never seen it so packed. Even though I joke about the annoying show they put on before they lit the tree, it was a great way to get in the holiday spirit! The Julians’ last night in the city we decided to introduce them to the wonderful world of Goood Frickin Chicken which Kevin and I frequent. As expected, the Julians loved the food there and we had a great last night together hanging out like old times. Lola’s been acting up a lot lately and it started to really get to me and put a damper on things. Kevin leaves for school between 2-3pm every afternoon and I get home between 5-6pm so Lola is left outside for a few hours a day. Each night when I’d get home, I could expect to be greeted by an excited Lola but also a nice pile of crap that she tore up while she was alone. I’ve come home to a bag of charcoal torn up and strewn across the yard, the hose pulled off the stand with a few holes added to it, her water and food bowls torn up to shreds, and the best yet…her doggy bed torn up and the stuffing all over the yard. It was getting extremely difficult being happy with her in the evenings after having to clean up her crap and knowing that money was just being chewed up and spit out each day. So one night last week when I came home to a bag of wood chips torn up I decided to Google the issue and see if I could find any solutions. Come to find out…she has anxiety problems! (Go figure…) Each time we would leave her, she’d get separation anxiety and would act out as a result. The most eye-opening part of my research was that us humans were the ones causing the problem in the first place. Something I found extremely interesting and also quite sad is that separation anxiety is the #2 reason why dogs are put up for adoption and euthanized…the dogs seem unruly and just plain ol’ “bad” and so are given up…but in reality the humans are the ones that need to be trained to fix this behavior. I found two great articles on this topic (links here and here) and Kevin and I have been working really hard this past week to help Lola with her anxiety problems. It really seems to be working…she’s getting more used to being by herself even when we’re home (so that when we do leave it’s not such a shock to her) and she’s starting to calm down before and after we leave so that our leaving is not such a big deal anymore. Tonight we were actually gone from 1-7:30pm and when we got home not a thing was torn up! 🙂 So far, so good! Last weekend on Saturday we decided to take a trip to Golden Gate Park and have a picnic lunch. We went to a part of the park that’s pretty quiet and off-the-beaten-path (on this map, we were near number 25 in the key) and spent a great few hours in the sunshine, enjoying our sandwiches and chocolate chip cookies, and playing fetch with Lola. We’re trying to take advantage of the sunny days because we won’t see many of those for a while come December! This past week has been pretty stressful for me at work because it was our university’s time for review by the California Commission on Teacher Credentialing. Luckily they’re allowing us to continue to run a teacher credential program (thank bajeezus!) though we have a few things we need to improve on, luckily nothing in my role is affected by that. I also came down with a bit of bronchitis (fun!) though luckily it wasn’t as bad as I’ve had it before and thank goodness it wasn’t the dreaded swine flu! Kevin and I both have really enjoyed moving up to SF where living green is not only a part of the general public’s consciousness already but it’s also integrated into the law (where plastic shopping bags are forbidden to be used in major grocery chains and composting was just made the law for residents and businesses in October). Every year Green Festivals are hosted in major cities across the U.S. and this year’s SF Green Fest was this weekend so Kevin and I spent a few hours there today. There were tons of booths with different organizations and companies that are committed to sustainable living and they had great free samples and handouts. There were food booths and demonstrations and speakers and a lot of great information was being shared. Our favorite part was learning about the home composting system called the Worm Factory which seemed like the easiest and quickest way to home compost we’d ever heard of before. Not much else is going on in our little world…next weekend we’re going to visit our friends Stacey, Jay, Isabella and Tasi (see previous blog post about visiting them here) and we’re looking forward to having some visitors during Thanksgiving which is going to be a lot of fun. So we might not have much to blog about for a bit but don’t fret I’ll be sure to update again when there’s something worth updating you all about! I had a great Halloween week! 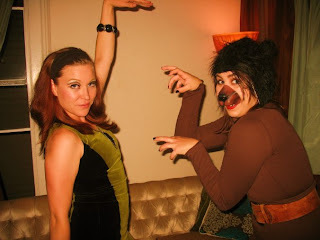 The weekend before Halloween (Fri. 10/23) Jessie and her roommates hosted a pre-Halloween bash at their apartment. 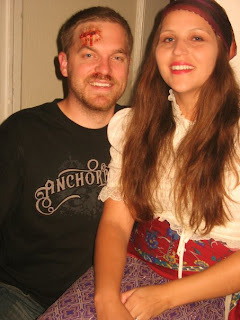 This year I dressed up as a gypsy and Kevin put on his annual gory wound makeup. At the party we spent a lot of time talking, laughing, drinking, eating and dancing away to some great tunes. Then a group of us (Lisa R., Cathy, Jessie, me and Rebecca–pictured below) decided to keep the evening going and went to a couple of bars in the area. Trying to get into character! 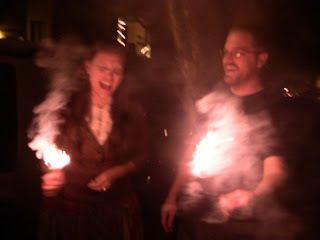 Katie had some sparklers so we decided to go out front and light ’em. 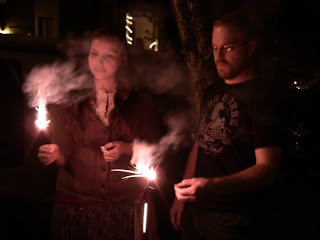 I mean, who doesn’t like sparklers?? We met up with my sister that night and went to Yo Yo Sushi for dinner (yummmm!) It was very reasonably priced for a sushi bar in SF and the sushi was delicious! Kevin got a fruit-filled crepe, I got chocolate mousse (but he heard me wrong at first so got me a Nutella-filled crepe with bananas on top and when I told him that the order was wrong he gave me my chocolate mousse and let us keep the crepe! ), and Jessie got a crepe flambe. Kevin and I had a great time back at home and can’t wait to go back! We landed in Long Beach early Thurs. AM and Kevin’s mom Dorothy came to pick us up. Kevin went to visit some friends at Yamaha where he used to work so Dorothy and I went to lunch together at Grounds Cafe (they have delicious sandwiches!) That afternoon we hung out with Kevin’s family and then that night we went to spend some time with my mom. 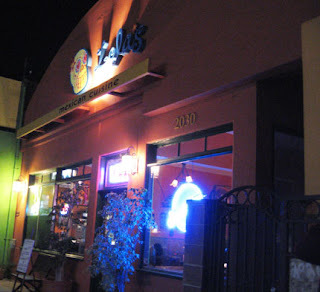 We went to dinner at Lola’s Mexican Restaurant (they have the BEST cilantro salsa I have ever had and great molé!) and had a lot of fun just spending time with my mama. Then my mom took Kevin and I on an adventure in Little Saigon–Chinese massages! My mom’s a big fan of getting these so for our birthdays last year she said she’d take us so we finally made some time to do it! It was quite the experience. We enjoyed it a lot and felt pretty refreshed (and a little beat up! haha) afterwards. We treated ourselves to some Vietnamese noodles and soup afterwards at a small cafe in the shopping center. After that adventure (thanks again mama!) we went with Kevin’s parents to our nephew’s high school football game to see him perform in marching band. Josh is a sophomore at Mayfair HS and he just started band this year playing the trombone. We met Kevin’s sister Judith and our neice Katelyn there and had a fun time just hanging out at the football game! That afternoon we spent some time at the Edmonds’ home having a barbecue. Dorothy made my favorite ribs ever and it felt like old times again hanging out in the backyard with Dorothy, George and Thomas. Sunday was our last full day in town and Kevin’s family hosted a joint birthday party for our neice Katelyn (her birthday was Oct. 11th) and mine (my birthday was Oct. 20th). Sarah, Rob, Judy, Lisa, Brian, Brianne and the rest of the “regulars” came to celebrate. That night we went back to my mom’s with Brian, Brianne and Thomas and spent time hanging out with my mom. We had to hit the sack early that night because of our early AM flight the next day. 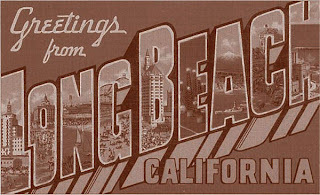 Kevin and I are VERY excited to be making a trip down to Long Beach this upcoming weekend after 3 1/2 months away! Lots of fun events planned–seeing our nephew Joshua perform in the halftime show at his high school’s homecoming game (he plays trombone in the marching band), staying at my mom’s house over the weekend and all the crazy fun that is sure to ensue, seeing my family’s dog Lukey, a BBQ with the Edmonds family, meeting the newest member of the Lord family (baby Dylan born 9/24 to our good family friends Celia and Chris), a joint birthday party with my niece Katelyn who turned 10 years old last weekend, and of course Oktoberfest! Hope you all are doing well and if we don’t get to see you this weekend, we’ll be in town for a longer period around Christmas so hopefully we’ll meet up then! On Friday 10/9 I had the day off from work and Kevin had the night off from class so we decided to take a road trip to Alameda & Oakland near where Kevin has classes. He had driven by the Martin Luther King, Jr. Memorial Park, Arrowhead Marsh many times before but didn’t have much time to visit so we took a day trip there with Lola. It’s a really pretty area and a nice, peaceful retreat in the middle of the city of Oakland. Though I don’t think we’ll be driving across the bridge just to go to this park again, it was a nice get away from the city for a change!